Magnaplast innovative chamber system for house and site drainaging. 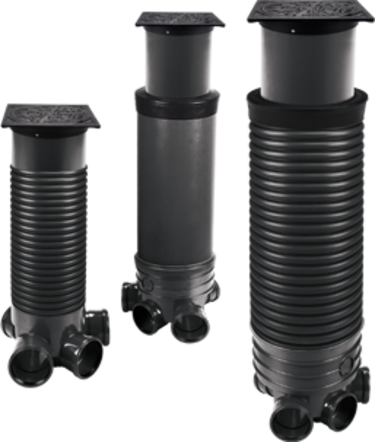 The system consists of three parts: chamber bases, risers and telescopic covers. 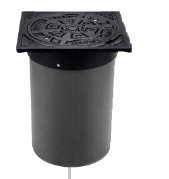 SC – A system of inspection chambers made of plastics and consisting of three parts:a chamber base, a raising pipe and a telescopic cover with a cast-iron hatchway. The system is manufactured in three versions with respect to the diameter of raiser shafts:smooth shafts with the diameter of 315 and 400 mm, and corrugated shafts with the diameter of 425 mm. 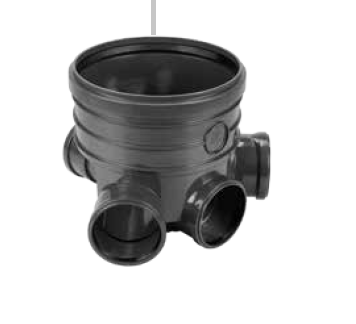 The telescopic cover is an intergal part which connects the telescopic pipe with cast iron manhole. The inspection chambers should be mounted according to the technical design for the sewerage system, in a properly prepared and drained excavation. 1. Before mounting the inspection chamber, remove any large or sharp stones from the excavation and prepare a coarse-sand bed (min. 10 cm thick). 2. Place the chamber base on the excavation bottom (remember it should already be levelled with a bottom slope of 1.5%) and connect to the sewerage system pipes. To prevent movement of the chamber base, backfill the trench to 10 cm over the pipe level. 3. 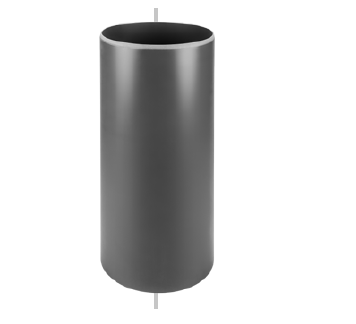 Cut the rising pipe to the required length (in the case of a corrugated pipe - the cut is made on the notch and seal is installed in the concave section after the first notch). 4. Remove any dirt from the chamber base. Smear the chamber base internals and the seal on the rising pipe with a lubricant, and then install it in the chamber base socket. Having prepared the inspection chamber this way, backfill it with easily-compacted soil. Each layer of the backfill should not exceed 30 cm. 5. a) in the version with a corrugated rising pipe (type 315 or 425), install a seal inside the pipe, in its last concave section; then, install the telescopic cover; b) in the version with a smooth rising pipe (type 400), install the cover. The rubber reducing seal is to be ordered separately.